The Biondelli family estate of 10ha is located in Bornato, an ancient town nestled at the heart of Franciacorta , in the Italian region of Lombardy, on young, nutrient poor morainic soils that are ideal for naturally controlling the yields of his grapes. The centre of the wine estate lies in a 16th century farmhouse located in front of the historic medieval castle of Bornato (today’s villa Orlando) and at the inception of the charming Longarone Valley, settled in-between the villages of Bornato, Cazzago San Martino and Calino. It’s the same places where in 1438, during the war between the Duchy of Milan and the Republic of Venice for the control of the territories of Brescia and Bergamo, the troops from Milan under the command of Nicolò Piccinino fought against the venetians soldiers leaded by Antonio Martinengo from Brescia and Erasmo da Narni, better known as “ Gattamelata” (one of the greatest military leaders of the Italian Renascence). The estate, known as “Breda” (a term deriving from the Latin “proedium” or from the Lombard “braida” and which indicates an estate consisting of different pieces of land distributed around a central farmhouse), was acquired during the aftermath of the second world war by Giuseppe Biondelli, Italian Ambassador tobe and Italian Consul General in Innsbruck (Austria) at that time. As a matter of fact, prior to becoming property of Ambassador Giuseppe Biondelli, the estate belonged to Count Alessandro Fè d’Ostiani (1825-1905), Senator of the Italian Kingdom and Minister Plenipotentiary (a Diplomatic Envoy) in China, Japan, Brazil, Belgium and Greece. The estate then passed down to his daughter Paolina who married Count Charles Jean Tristan de Montholon Sémonville (1843-1899) who was also a diplomat and became French Ambassador to Switzerland. These traces of a glorious past that saw Bornato as a crossroad of European diplomacy for a century, set the foundation for the will and aspiration of the Biondelli family to bring the wines of Franciacorta far beyond national borders. The ancient farmhouse has been completely restored and further developed, with the construction of an underground wine cellar, in order to establish a modern structure to vinify expertly the different types of grapes: only Chardonnay for Franciacorta Brut and Satèn spumante, while the black grapes Cabernet Sauvignon, Cabernet Franc, Merlot, Nebbiolo and Barbera are for the still Curtefranca Rosso. Today Carlottavio, son of Giuseppe Biondelli, along with his wife Mariella and his sons Francesco and Joska, runs the wine business with passion and devotion. In particular Joska, fresh from his own ‘diplomatic’ service abroad as a London headhunter, has returned to realize the dream initiated by his father in 2000. The first vintage to be bottled was in 2009. The name 'Satèn' reflecting the satiny feel of this traditionally made, 100% Chardonnay sparkling wine, the produce of only the first, finest pressing that's been aged on its lees for 30 months prior to disgorgement. In fact it's the pretty, tight bead of bubbles that catches the eye and delights the palate; a gentle effect brought on by using less dosage/sugar to stimulate the second, carbonic fermentation; so there's less 'gas' too. 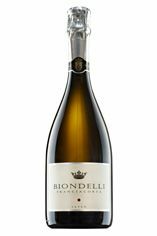 Joska Biondelli has produced a beautifully pure wine, with ripe pear and white peach stone fruit, such precision and balance. 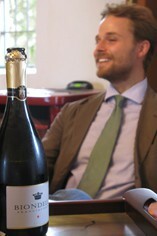 But then his family have fine vineyards at the centre of the Franciacorta zone, so the foundations are in place. A great new beginning for Joska and for the wines of Franciacorta. Drinking but will keep.